Happy Monday loves! It is a happy Monday around here because I am not at work and we are getting ready to leave for FLORIDA in just a few short hours. Right now I'm waiting for our sheets to dry so I can make our bed and when we come home it will be clean and ready for us. Since I'm overly excited and in the mood to blog I thought I would share this past weekend with you. Later that night we went to the 99 Restaurant in Westerly and both devoured French Onion Soups. The above picture is my entree which is Macademia Crusted Chicken. This meal is delicious and mixed with the rice and asparagus it is my favorite item on the 99 Restaurant menu- if you haven't tried it, I highly recommend it! 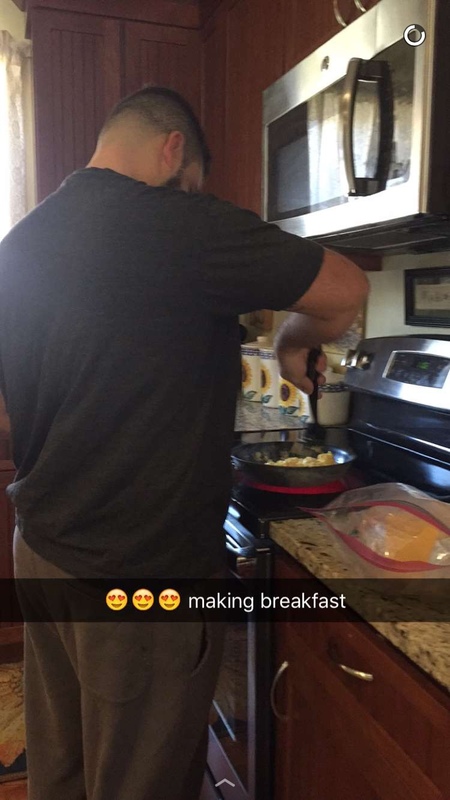 Saturday morning and I've got my favorite boy in my kitchen cooking me eggs, how did I get so lucky?! On Saturday I also headed to the movies with Brittni and Stephen to see Allegiant, the newest Divergent movie. It was their first time away from Emma so I crashed their date and saw the movie with them. It was a pretty good movie but very different from the book! I couldn't believe all the changes that were made and I'm tempted to re-read the book to see if I can pick up any others. Purchased this cool item over the weekend. I will be reviewing it here on the blog soon. It's a way to get that beautiful twist hairstyle that everyone is sporting lately. I have a hard time because my hair is so thick getting it to look right so I was hoping this little tool might do the trick. I spent most of Saturday night packing. I may have overpacked but I'm always afraid I won't have enough! Super yummy! Notice my side is mostly sauce with a little cheese and Tim's side has bacon and pepperoni. It's nice to be able to have your pizza exactly how you want it! I'm not sure how much you'll hear from me this week but I will try to pop in! Enjoy the snow Rhode Island- see ya later! How To Get Organized NOW!